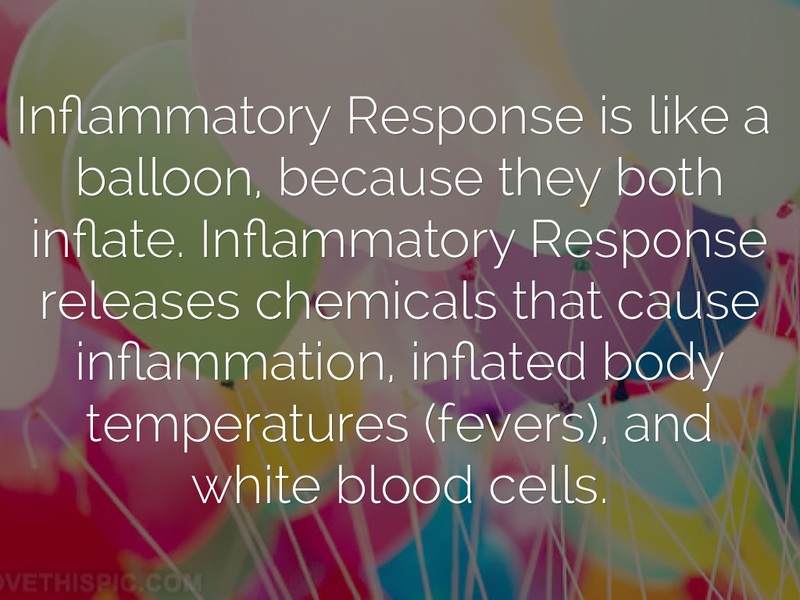 Inflammatory Response is like a balloon, because they both inflate. Inflammatory Response releases chemicals that cause inflammation, inflated body temperatures (fevers), and white blood cells. 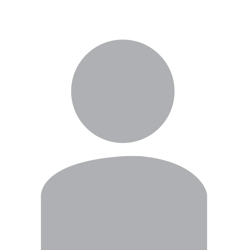 Inmune Response is like a computer. 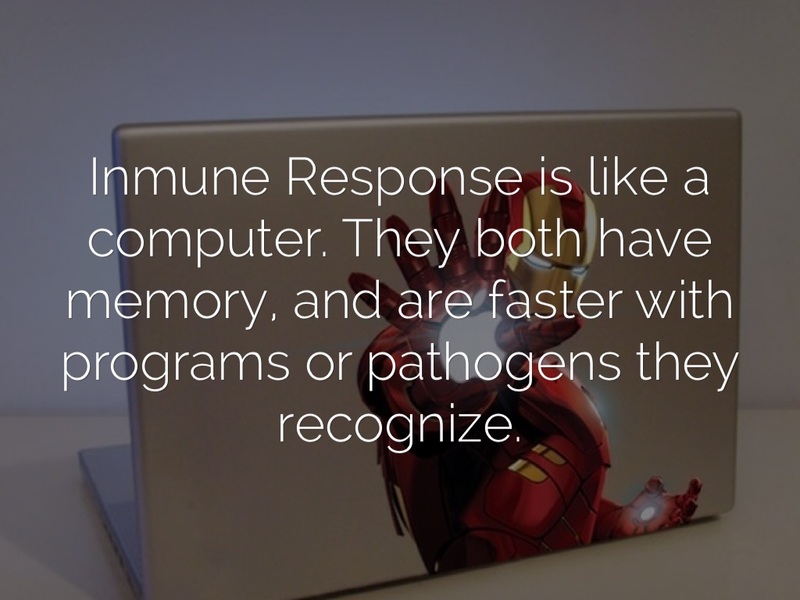 They both have memory, and are faster with programs or pathogens they recognize. 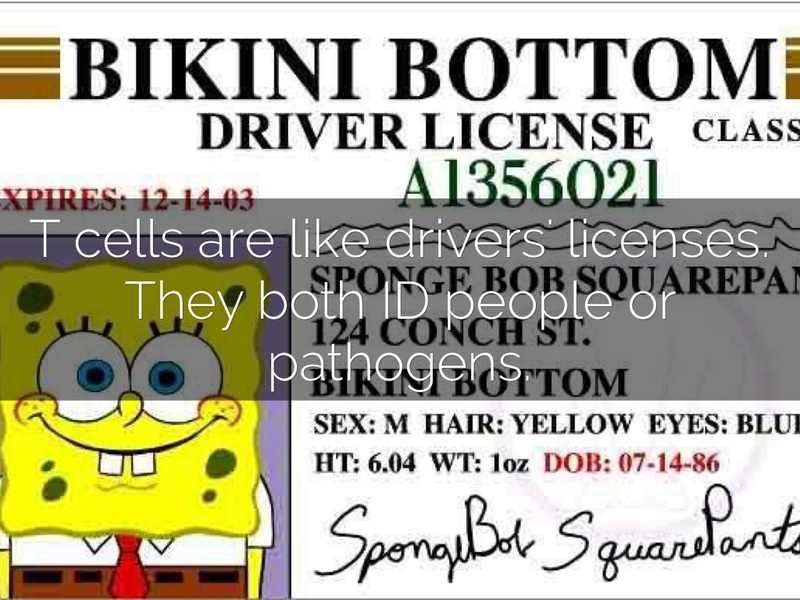 T cells are like drivers' licenses. They both ID people or pathogens. 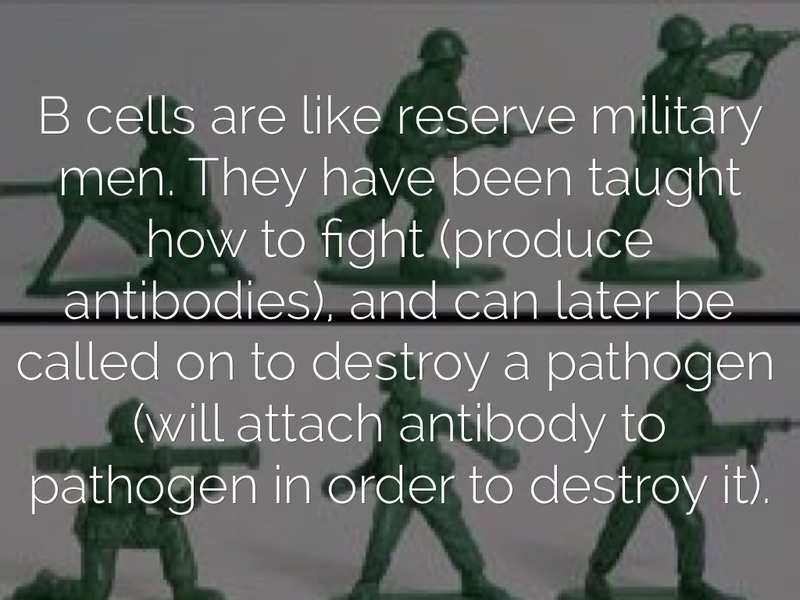 B cells are like reserve military men. They have been taught how to fight (produce antibodies), and can later be called on to destroy a pathogen (will attach antibody to pathogen in order to destroy it). 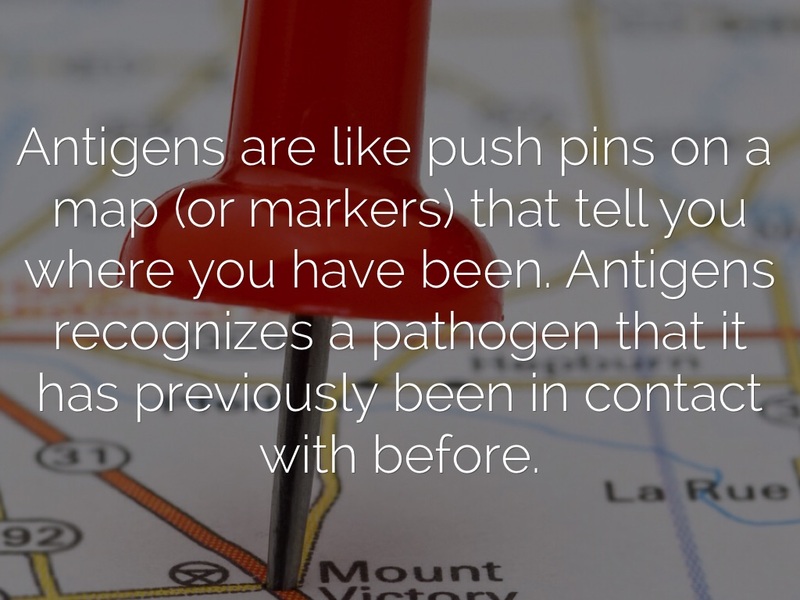 Antigens are like push pins on a map (or markers) that tell you where you have been. 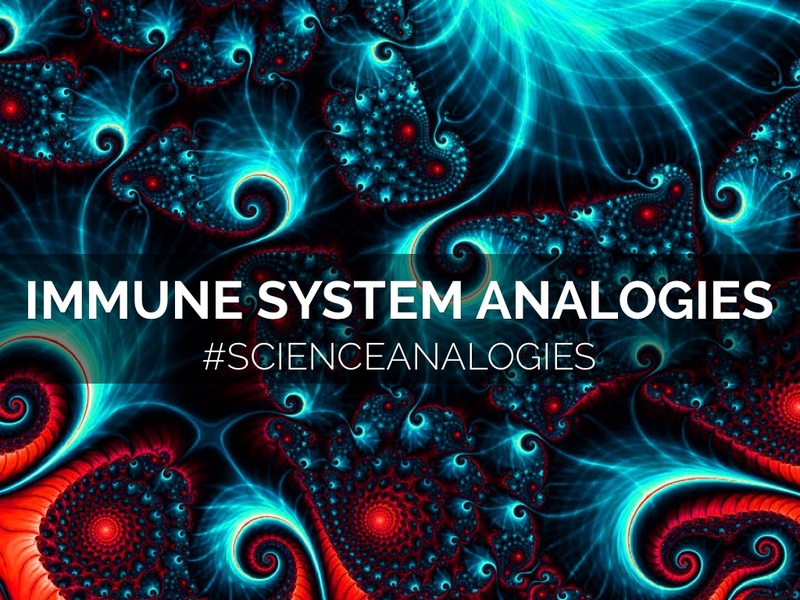 Antigens recognizes a pathogen that it has previously been in contact with before. 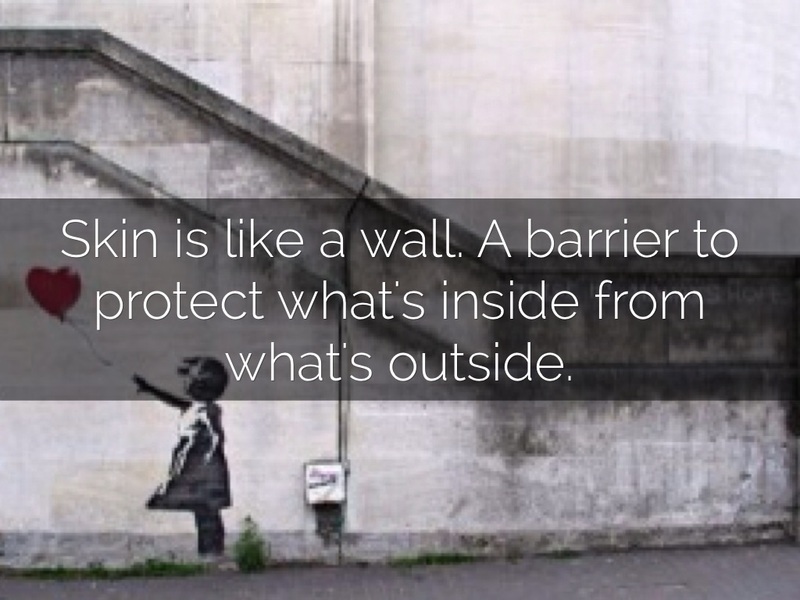 Skin is like a wall. A barrier to protect what's inside from what's outside. 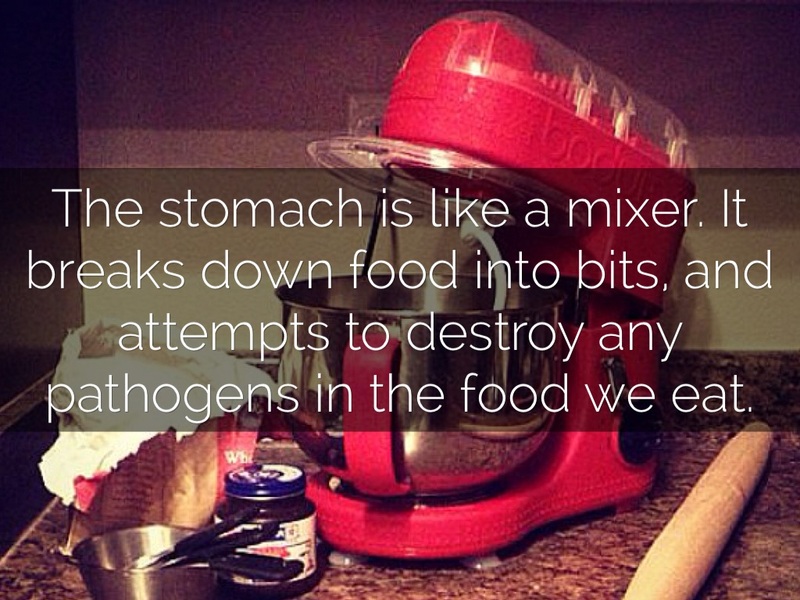 The stomach is like a mixer. It breaks down food into bits, and attempts to destroy any pathogens in the food we eat. 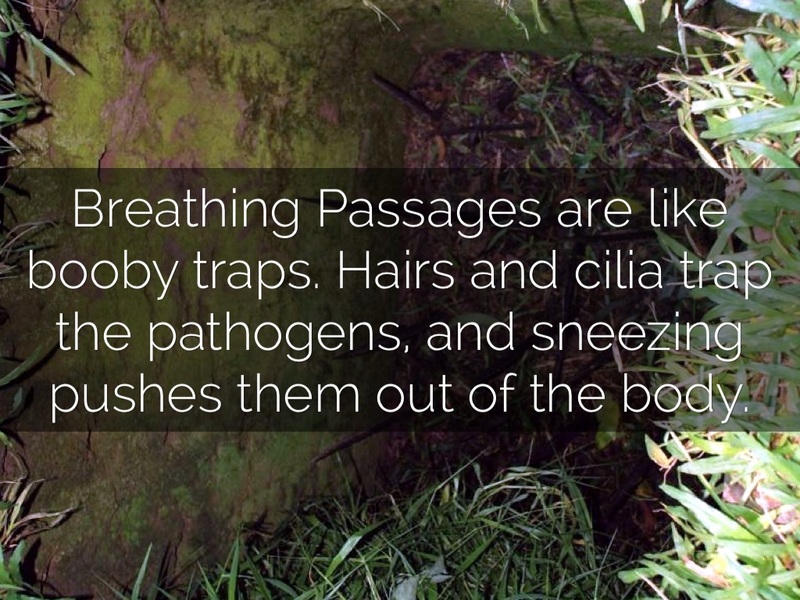 Breathing Passages are like booby traps. Hairs and cilia trap the pathogens, and sneezing pushes them out of the body. 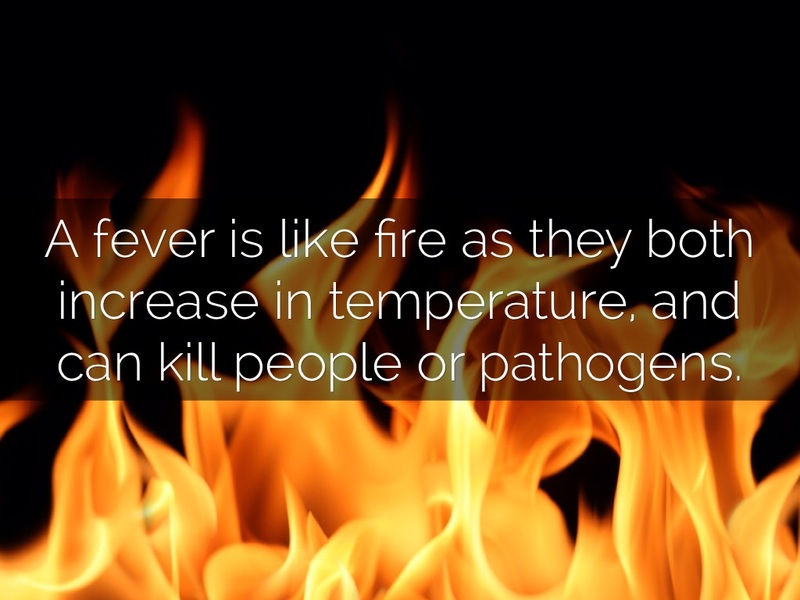 A fever is like fire as they both increase in temperature, and can kill people or pathogens. 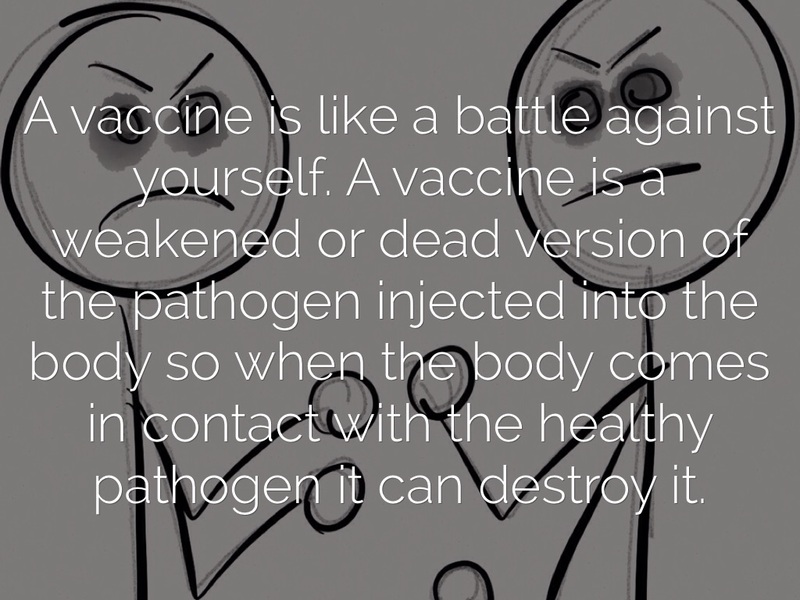 A vaccine is like a battle against yourself. A vaccine is a weakened or dead version of the pathogen injected into the body so when the body comes in contact with the healthy pathogen it can destroy it. 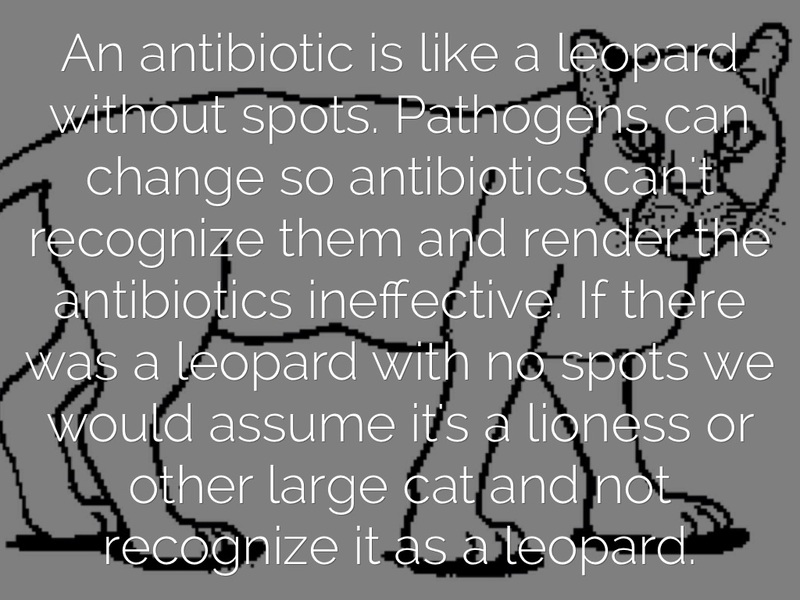 An antibiotic is like a leopard without spots. Pathogens can change so antibiotics can't recognize them and render the antibiotics ineffective. If there was a leopard with no spots we would assume it's a lioness or other large cat and not recognize it as a leopard. 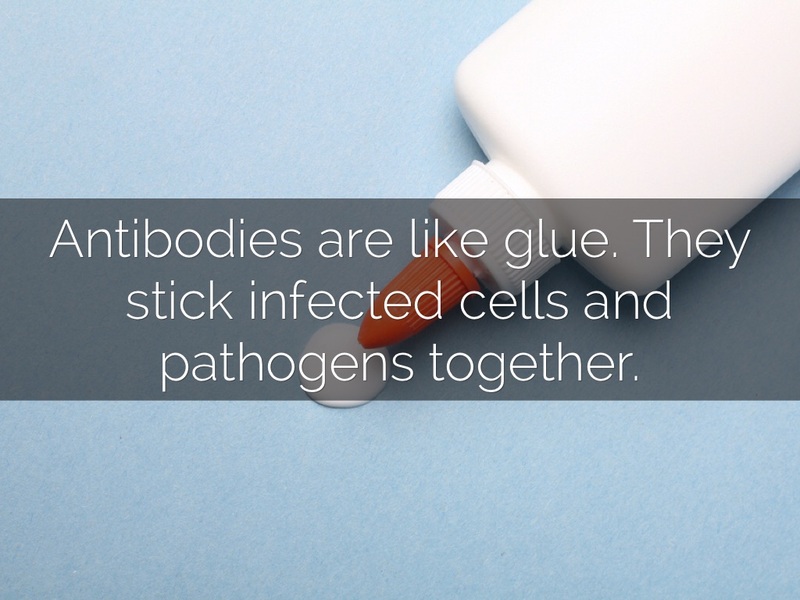 Antibodies are like glue. They stick infected cells and pathogens together.